This course focuses on a real-world approach to communicating tactfully, which will allow you as an instructor to provide a baseline for your officers that will reduce liability, promote professional image, build rapport, and even save lives. The strategies and techniques learned are a resource every officer should have in the field. This course focuses on a real-world approach to communicating tactfully, which will allow you as an instructor to provide a baseline for your officers that will reduce liability, promote a professional image, build a rapport, and even save lives. This training is a hands on scenario based course that gets you as the instructor involved in classroom participation that will provide results. This instructor course delivers to you the necessary skills of persuasion that you can demonstrate to your officers. The is a necessity for any law enforcement agency looking to expand on the ever changing expectations of communication, and the strategies received will provide you with an effective blueprint to solve potentially unreceptive situations before they erupt. These are techniques every officer should have as a resource in the field. The instructor teaching this course offers real world experience based on what we in law enforcement deal with on a daily basis. He will demonstrate ways to avoid being in a conflict by using persuasion instead of physical force. You will be surprised by the knowledge you will gain after attending this course and be able to translate that knowledge to your officers, which will only help them have a long and prosperous career. This course does fill up fast! I recently took this course. I was impressed with this course and I can take everything I was taught and apply it to my job. I was provided many resources to take back to my agency to facilitate training our folks. I recommend this class. 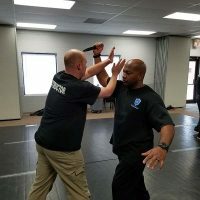 I have been in Law Enforcement for 38 years and I would like to say that Jason presented and demonstrated the techniques and information very well and this course will help my Officers and every Officer that takes this course. I recommend this course to every Police Department and I will be telling every Police Chief this is a GREAT course. Excellent class that should be taught nation wide. The instructor is highly engaging and knowledgeable. This is a must for every cadet and street officer. 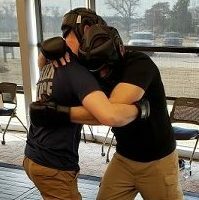 This course was a great combination of giving specific tactics of how to verbally control a situation while also giving specific limits of where verbal communication is no longer safe. Jason has a lot of personal experience that he relates to the students, which made for an engaging class. I learned a lot that I am looking forward to teaching to others in my department. This is n excellent class would recommend all officer get a chance to attend. Sound communication principles; the course is well suited to help officers decrease the need for using force and increase the ability to gain cooperation and information from difficult people, and do so in a safe way. The course prepares instructors to teach the principles effectively. I highly recommend it. very good class. the Instructor was a great communicator, and I really learned a lot from conducting and participating in the scenarios. If you are in Law Enforcement you need this class period. Very impressed with this course. It was presented well and the instructor was very knoledgable with the subject matter. This was not one of your sit and listen courses, class participation was encouraged from day one. The material was designed to be easily adaptable to specific agency needs. Not only will I be able to present the material to my officers, but will be able to use in my professional and personal life. Blue shield tactical did a fantastic job with this course. Completing the course today and I’ve got to say it really builds on other training. I feel by completing this course, I’ll be able to build up my officers and give them better tools than with other courses. This course is an excellent course for every law enforcement officer today! Instructor Jason Taylor does an excellent job in presenting the material and working with the students in the class! I recommend this course to everyone! Fantastic course. Currently attending day three and although I previously thought I had an above-average grasp on “verbal judo” & “de-escalation”, the content far exceeded not only my expectations, it effectively tripled my knowledge. Jason is a fantastic instructor. He’s motivated, engaging, and passionate about teaching. If I can pass on the skills I learned even HALF as effectively as Jason did, the course will have paid for itself. Given the litigious society we live in now-a-days, courses like this are worth their weight in gold. I highly recommend it to any peace officer. If you’re an administrator, I recommend this course for your force instructors. Great instructor. Excellent information. Highly recommend!! This course was excellent and covered multiple subjects and scenarios. Jason Taylor is an outstanding instructor and has the ability to keep everyone actively engaged. Some of the content covered in these courses can be rather mundane but Taylor’s delivery keeps it moving. He intersjects humor when appropriate which lightens the mood and helps move tge class forward. Would HIGHLY recommend. The was an excellent course for all experience levels of law enforcement. The instructor was great. He was very knowledgeable and did an excellent job of presenting the material while relating it to real world situations. I would definitely recommend this course to others. This course is excellent. The instructor is able to explain and relate it to situations. I would definitely take another course from the instructor. Well done! Class was great. The instructor is very knowledgeable and kept the class engaged. The scenarios are great as they apply to everyday calls officers receive. I recommend this course to all law enforcement officers especially to new incoming officers. This course was very good. The instructor explained the importance of good communication skills. I recommend this course and instructor very highly. Great Course! Instructor Taylor was great. This course was a combination of course I’ve taken in the past. It gave me new information to pass along and put a title to some tools I use on scene. Good information relative to job. Multiple options offered to complete objective. Instructor was very enthusiastic and kept students engaged. Great content and Jason Taylor does a very good job presenting the necessity of the tactics and how to employ them in a real situation. This course was amazing. Jason Taylor was an amazing instructor. Blue Sheild Tactical provides the best training. Great course. Jason Taylor was a great instructor. I feel like he actually practices what he teaches. This is a conservative version and does not put officers in compromised positions. The course reinerates how to treat everyone with respect. Great Course! This is an excellent course. The instructor was very knowledgeable. Good information provided. Instructor enthusiasm was awsome. Very job relevant. The De-Escalation Intructor Course is phenomenal. Jason presents it in a way that is, both, educational and informative. The course not only forces you to think out side of the box, but teaches you how to do it. I recommend it to anyone. Excellent class. Its a needed lesson for all officers. I am looking forward to instructing this to help iur law enforcement officers do their job more wffectively and safely. This class is absolutely necessary for law enforcement. Officer Taylor is a great instructor and made the class very educational and eye opening. The De-escalation instructor course was excellent. Jason Taylor presented the class in a professional and informative manner. The course can help any level of officer become more proficient in their job and reduce unnecessary use of force by officers. This class was a great class. Officer Taylor was a great instructor. He kept my attention throughout the entire class. There was a lot of helpful information. Good course. It was a smaller class and it was compmletelnew for me in this type of training. I felt that it was a very hands -on, and will be very useful in my everyday duties. The subject material was explained well by instructor Taylor. He was very energetic and it was easy to see that he was passionate about the subject material. As an officer with 25 years, I would highly recommend this course for any level of law enforcement. Excellent course! I would encourage anyone who deals with the public to attend this class. Excellent information and real world application techniques!